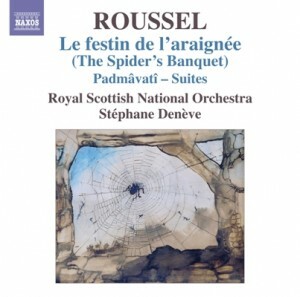 One of Roussel’s most performed orchestral works, Le Festin de l’araignée (The Spider’s Banquet) was composed during his earlier impressionistic period, and depicts the beauty and violence of insect life in a garden. Roussel’s experiences as a lieutenant in the French Navy first introduced him to Eastern influences, and the ‘opera-ballet’ Padmâvatî was inspired by his later visit to the ancient city of Chittor in Rajasthan state of western India. It uses aspects of Indian music to evoke this city’s legendary siege by the Mongols. This is the fifth and final volume in Stéphane Denève and the RSNO’s acclaimed survey of Roussel’s orchestral works. This final installment provides a worthy and memorable conclusion to the series. In the first place, the two suites from Roussel’s magnificent opera-ballet Pâdmavatî are all but unknown, either in concert or on disc. They are wonderful, not least because the obligatory touches of Eastern exoticism are fully integrated into Roussel’s personal idiom. All of his music, even the lightest or the most purely tactile and voluptuous, has substance.